I am a millionaire in this country. The fact was never more evident to me than it was in the moment when I sat in a private bar drinking espresso shots with members of the Ramones and Misfits. I found my way easily upstairs to a new, multi-level Hard Rock Café that I hadn’t been to before. It was easy to find – I merely needed to follow the off-key chants of ‘Rock, rock, rock, rock, rock ‘n’ roll high school!’ upwards to the entrance – and as soon as I saw the layout, I realised I might have made an error when purchasing my silver ticket. There had also been a gold variety available, along with a VIP option, which I had considered, but the woman at the ticket counter had made some enquiries and told me that silver tickets were standing room, whilst gold seemed to be caberet-style seating. I had no intention of sitting for a set of Ramones classics. When I arrived and glanced past the counter to the inside, I could see the stage set up before an empty floor, with a couple of booths around the edge – obviously the ‘caberet seating’ I’d been told about. An arrow pointed upstairs to the silver section, and I followed it to a balcony overlooking the stage. This called for drastic action. The line was moving slowly. I became impatient. Ahead of me, Americans were presenting scraps of printed paper claiming these entitled them to VIP access. I had an actual ticket in my hand, and asked the ladies behind the counter if I could perhaps cut ahead since my business seemed much simpler. I backed up my claim by waving my ticket for all to see. This saw me invited inside, where it was only too simple to explain my situation and pay the difference. Since, as I said, the generous exchange rate between Australia and the Philippines rendered me a millionaire and ticket prices obscenely reasonable, I not only upgraded my ticket to a gold pass, but went with the VIP option, and was ushered into a private bar. As well as the aforementioned espresso shots, I bumped into an intimidatingly tall figure. I apologised nervously, as I realised it to be none other than Pepe Smith of Speed, Glue & Shinki. I guess it made sense that he would be a fan, with all the glue-sniffing references that surrounded the group. As the band members disappeared from what seemed like a once-in-a-lifetime experience, I headed out to stake my claim to a spot in front of the stage. It was refreshing to see such a big name act in an intimate venue, and one unencumbered by the usual security barricades. A guy named Brew Reyes appeared on stage as the MC for the event, and I learned that he is actually a famous Pinoy Punk icon, despite his sensible hair and immaculately clean brown leather school shoes. Without much further ado, and without a support band – we were advised they would be performing after the headliner – Blitzkrieg were announced and the lights dimmed. The hits followed hard and fast after that for the next 45 minutes. 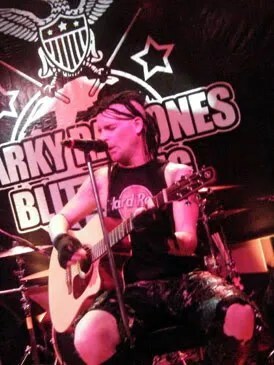 Each song was punctuated by Marky’s count in, with applause greeting each prediction of the song to follow. Highlights of the main set were, predictably, Beat On The Brat, Rockaway Beach, Cretin Hop, Sheena Is A Punk Rocker, and a better version of Rock ‘n’ Roll High School than the one I’d heard in the stairs on the way up. 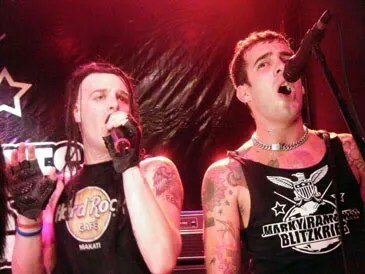 Michale Graves performs the songs in such a way that he is vocally true enough to the original material without simply emulating it robotically, whilst maintaining his own on-stage persona which is naturally more animated than Joey Ramone or probably the entire original line up ever were combined. And it worked well. Drenched in sweat, I welcomed the chance to breath as the band left the stage, the Hey ho! chant resuming immediately. After a while it was Michale who returned alone, acoustic guitar in hand, for a surprise collection of chilled out Misfits tunes. I don’t know how many people knew the songs, but I appreciated the laid back takes on Descending Angel and my favourite murder ballad, Saturday Night, before being rejoined on stage by Marky and the rest of the band for a more traditional take on Dig Up Her Bones. A new song by Blitzkrieg sounded more Misfits than Ramones, but possibly only due to its reference to angels in some kind of peril. It was followed by an unexpected cover of Creedence’s Have You Ever Seen The Rain, and the Ramones’ version of Louis Armstrong’s What A Wonderful World that was playing everywhere a few years ago. It wasn’t until the very last moment that the repeated chants of ‘Hey ho, let’s go!’ were finally answered with a blinding rendition of Blitzkrieg Bob that gave those in the midst of the floor one last chance to go crazy. 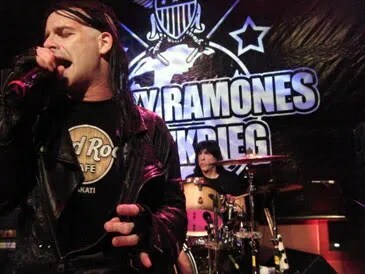 There may be people who criticise Marky Ramone for cashing in on his Ramones heritage with what is seen by some as little more than a pub cover act, but he has assembled a group who put on a good show, and ensure they play all the right songs at just the right moment. It was all very strange. In the foyer, and even the arena itself, I was surrounded by banners and advertising. As well as brand-name snacks and fast food, illuminated signs and animated video screens also promoted the jeans and designer shoes for sale at the shops underneath. I wondered who decided in the midst of a rock concert that they needed new pants. The ads continued as I took my seat, having to give way frequently to the popcorn and binoculars vendors and Pizza Hut and McDonald’s delivery boys patrolling the arena. With all of these items not only for sale, but conveniently delivered to my seat, no where for sale in the whole venue was the one item I like to enjoy before a concert: a cool, alcoholic beverage. There was no support band. Maybe that explains the excited roar that passed through the crowd at the faintest murmur of a sweaty Irish roady performing soundcheck, or at the briefest flicker of the light test. 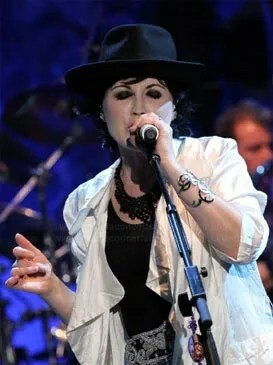 Eventually the Cranberries appeared on stage, looking much the same as they had fifteen years ago. Dolores O’Riordan still looks like somebody’s quirky art teacher, entering the stage to enormous applause wearing what looked like a black lacy jumpsuit with a super-wide boxing title belt. Over this she wore a light, white coat which caught dramatically in the breeze from on-stage fans. Her jewel-encrusted Converse Chucks reflected the spotlights, and she completed the ensemble with a black trilby. Although not putting on a particularly vibrant arena show, the band’s enthusiasm for performance was evident, and helped carry their concert, particularly for a band remembered for ‘that one song, and that other one too.’ The Greatest Hits set served as a reminder that the group did actually have several songs that performed well on radio, and some of the new songs also showed promise, mixing drum machines with the quiet-loud sound that made the group a hit in the 1990s. They closed powerfully with the highlight of the entire set, Salvation. Though I’ve never been too big of a Cranberries fan, it was an impressive performance which must have left me feeling good, because I was surprised to discover myself browsing the racks of baggy jeans in the doorway of a store called Anti-Fit on the way out of the Coliseum.